They instantly hit it off. 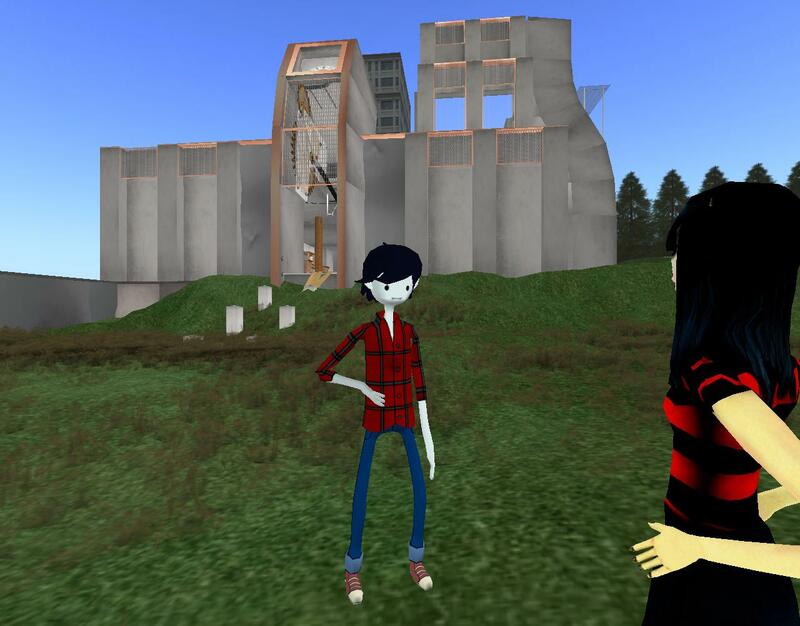 Ruby showed Timmy how to learn about land through the About Land description, and to see if they could rezz objects on such land and how long their stuff would stick around when rezzed if so. Also if other people could see them from other parcels, and visa versa. Ruby became a mentor to the 11 1/2 year old boy. So much like me at that age, Ruby thought. And as plain looking as me back then too! But Ruby dreamed that Timmy’s simple features would mature with the passage into teenage years, sort of like what happened to her (she supposed). Yes, she could dream. But tonight was a lesson in skyboxes. Although Timmy had seen things floating in the air, he always assumed the main build of any parcel was set firmly on the ground. Why build in the sky when you can terraform? Timmy at least knew about that Second Lyfe skill, since his father was a professional landscaper back in the continent’s Mountain Lake country where he’s from, as he explained to Ruby one day while pointing eastward. So that was kind of a mental block to him appreciating the *verticality* of Second Lyfe, which is also so much different than our own Real Life world. We do not build in the air except when first secured to the ground. And falling! Ruby demonstrated by flying high high high — way beyond sight — and just shutting off the flight powers and tumbling back to the Earth. To still earthbound Timmy’s amazement, she just got up and dusted herself off, unharmed in any way. “Wow,” he then said. “Do you think the doll people escaped by flying up in the air? Maybe their doll master was as dumb as me about such things!” Timmy here was referring to information learned from the About Land description for the peculiar warehouse caddycorner to his (and Ruby’s!) church on the empire property — where they were at the time, actually. “And this otherworldly giant who plays with their cases — might he still be around?” Ruby patiently explained that, to her, this “otherworldly giant” also mentioned in the land’s description is obviously a user. “The one you told me about, yeah,” said Timmy, nodding his rounded head. “The one before Fisher’s Island. But what about Meat City?” He points west this time. “That my child friend is a place we cannot go into at this point. Not until you mature more.” She studied his face again while they stood in front of that warehouse. So different from Tin Tin’s, who she had gotten use to in the past several weeks. No bevel in the middle obviously. And such a tall boy for his age! Ruby soon concluded from this and other evidence that Timmy was actually a doll himself, somehow left behind by the others of his kind and adopted by kindly mountain folk. It was disappointing — mostly, she admitted to herself, because it ruled out the possibility of a future lover upon maturity. Timmy’s face would never change from this. He would never get older because he wasn’t really biological. But this might be his saving grace later on. From his perspective at the time, Timmy was wondering about Ruby’s spiral etched wooden leg and the story behind it. Turns out… well, let’s save that for another night.